Monochrome is an enduring interiors trend. The key? Simplicity. If you’re itching to know the latest trends in the interiors world, you can find them right here on Houzz with just the click of a button. Simply hit the Photos tab on the homepage, filter by Newly Featured, and see the latest projects and trends appear right before your eyes. It seems monochrome is taking over this week, with a multitude of black and white rooms demanding attention. From the living room to the bathroom – and even the landing – you can work this trend into any part of your home. Go on, give it a try! Simplicity is key in this trend, and this beautiful bathroom has been kept incredibly pared-back for the ultimate statement look. 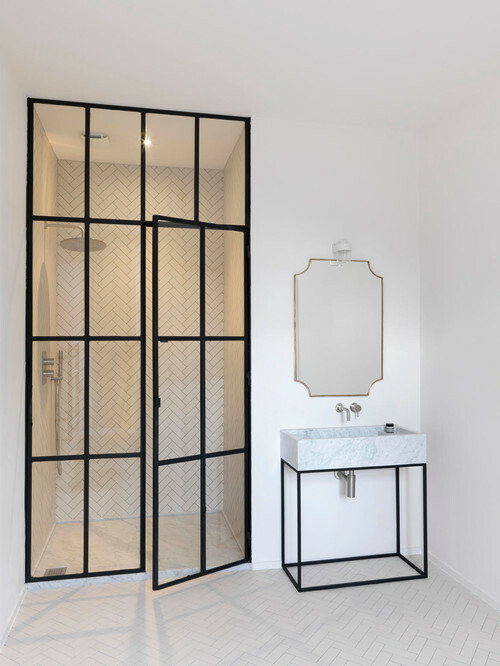 Plain white walls and a classic herringbone tile pattern allow the black-framed Crittall windows and vanity unit to shine. Investing in luxe materials, such as marble and brass, and keeping surfaces strictly clutter-free, give this look its elegance. A simple, white colour scheme is often the go-to when choosing a bathroom, so it can be a great place to put the monochrome trend into practice. 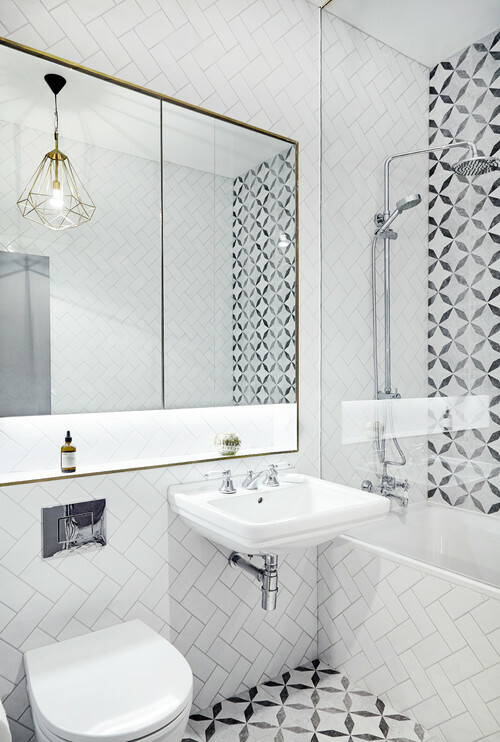 This compact bathroom pairs crisp white metro tiles and sanitaryware with monochrome feature tiles on the floor and bath wall. Also take note of the fine gold lines in the room, too – around the mirror and light fitting. They add a touch of glamour and lift this simple scheme. This hallway nook is a masterclass in monochrome minimalism. 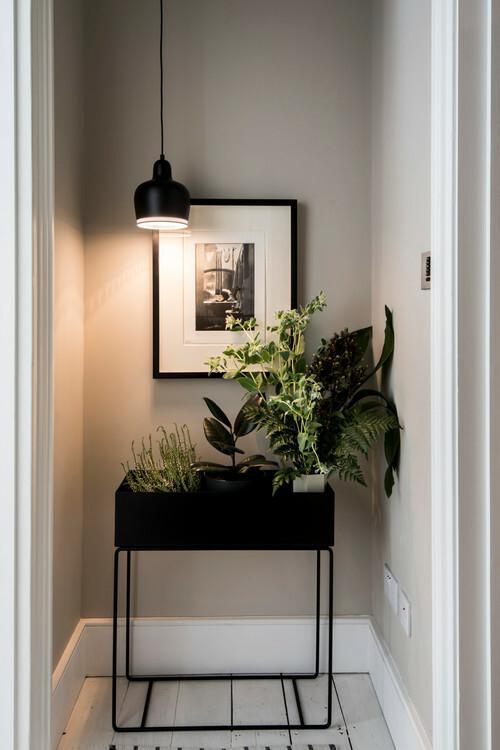 An elegant black planter is filled with leafy green plants and spotlit with a simple black pendant light. A black and white print in a (yes, you guessed it) black and white frame and mount respectively, creates a simple but effective vignette that’s packed with interest but not cluttered. If you’re looking to create a minimalist monochrome look, symmetry is your friend. 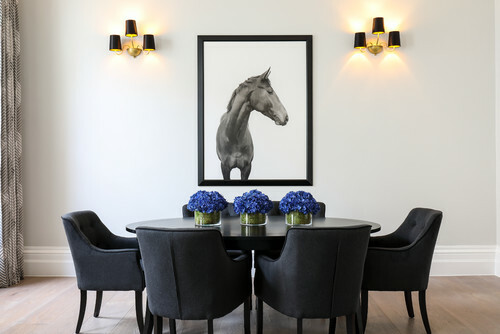 In this dining room, the perfectly centred artwork, neat row of vases, matching light fixtures and even number of chairs create a minimal look that also feels luxurious. The key here is texture: by contrasting a smooth, glossy table surface with richly upholstered dining chairs, the scheme oozes luxury and manages to be inviting and comfortable as opposed to stark. 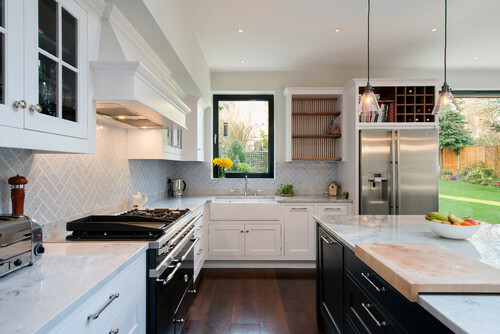 A quick way to warm up a monochromatic scheme is to include honey-coloured wood, as the owners of this kitchen have done. 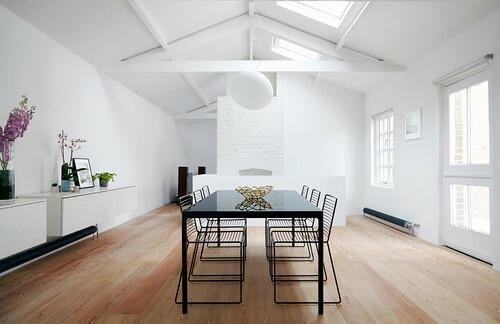 A pale timber floor and the wooden chair legs add character to the room. The gold pendant lights and lamp also take the chill off, and add just a touch of luxe. You don’t have to go ultra-modern if you’re planning on trying out this trend. Sometimes, the warmth of a more traditional style allows you to be more bold when choosing your monochrome style. Take this kitchen, for instance. The black island unit reflects the range cooker opposite, as well as tying in with the boldly framed window above the sink, while the crisp white units offer a fresh contrast. There’s no reason to hold back if you’re a fan of this trend. 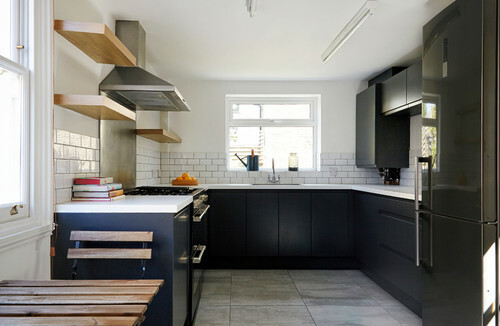 This kitchen, with its black cupboards and black fridge, is brightened up with crisp white walls and white metro tiles (with dark grout to add an edge). The open wood shelves keep the space feeling airy, and once they’ve been dressed with cookbooks, crockery or accessories, they’ll bring life and character to this smart scheme. If you’re head over heels for this trend, why not go all out and strip your interior right back to its bare and beautiful bones. 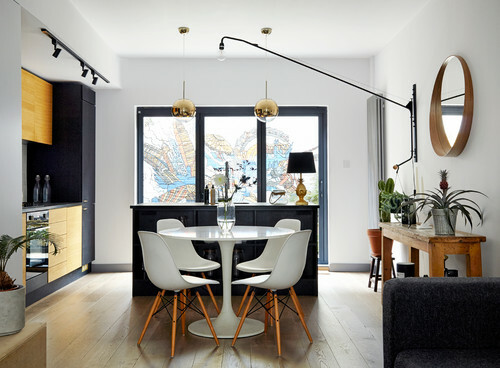 Large, bright spaces like this one, which is flooded with natural light, pack a powerful punch when painted top to bottom in dazzling white, and the addition of a simple black metal table and chairs brings a restrained beauty to the room.